This Creamy Spinach Soup with Parmesan Croutons is very easy, healthy and by far the best spinach soup I’ve eaten. Not to mention, with a few simple substitutions it can even be transformed into a vegan soup. I have two little boys, and I don’t know about other parents of 5 and 1 year olds, but I struggle with getting into their bellies. Especially the older one, because he is very picky, and unless they’re totally blended or juiced, we have a problem. However there is one exception: this Greek Spinach Rice is something they’ll both eat. Other than that, I have to hide spinach either in smoothies or juices. So, I decided to create this Creamy Spinach Soup to see how that goes. Both of my boys love creamed potato leek soup. I remember when my older one was in a daycare and I was sending him soups every day; one of the teachers looked at me and said: “I don’t know what’s in this soup but he LOVES it!”. And that was a simple creamed potato and leek soup. So, here I decided to use this base and just add bunch of spinach to it. To my relief, it worked! They both ate it with no problems. If you share in this struggle, please let me know how you get veggies into your kiddos. I’m curious and always looking for some creative ways to do this. 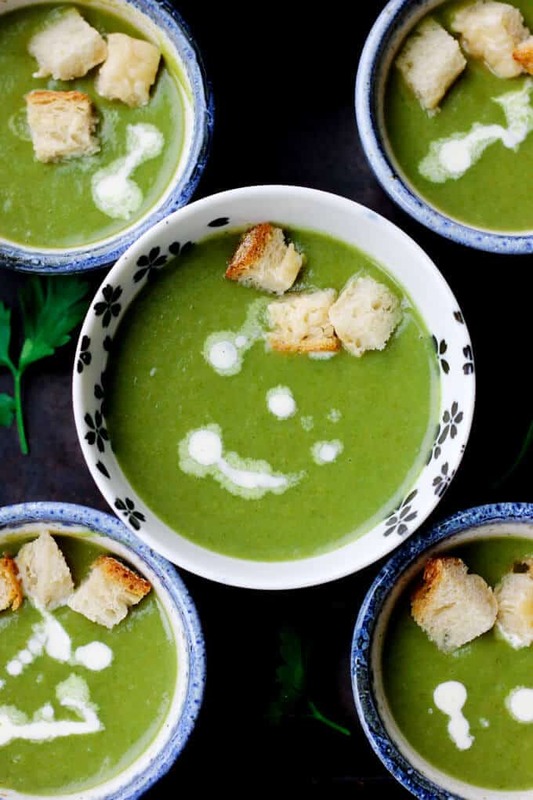 How do you make this Creamy Spinach Soup? omit the Parmesan cheese for the toast and just rub it with olive oil. 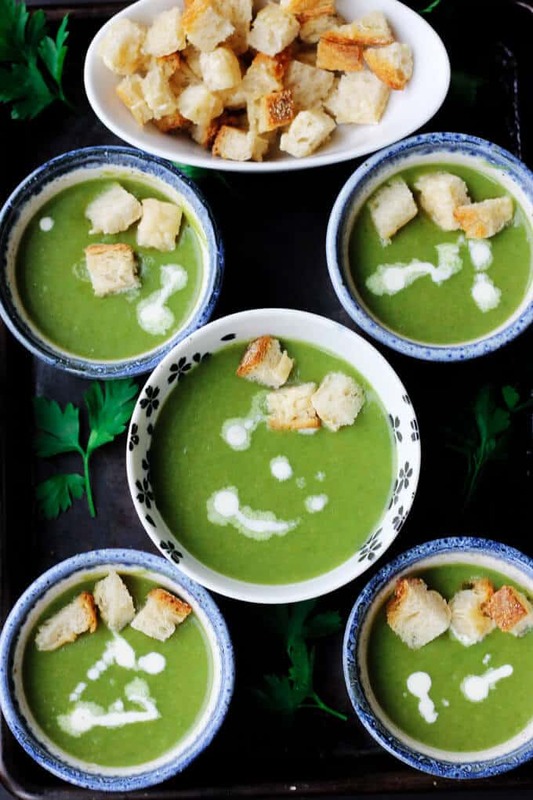 What do you need to make and serve this Creamy Spinach Soup? I really love cooking soups in a Dutch Oven (affiliate link) like this one . It makes it so easy for sautéing veggies first and then cooking them covered up. Obviously you can serve this soup in any bowl, but if you’re looking for something cute, these may be a good choice. I hope you will enjoy this soup as much as we did. Cheers! 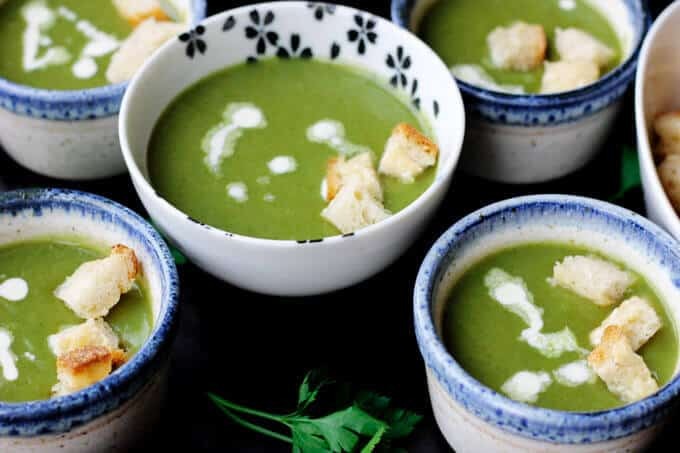 This Creamy Spinach Soup with Parmesan Croutons is very easy, healthy and by far the best spinach soup I've eaten. Not to mention, with a few simple substitutions it can even be transformed into a vegan soup. In the meantime, sprinkle the parmesan cheese on a bread and toast in a toaster over for approximately 5 minutes until crispy; Remove from the oven and cut up into squares. Using handheld mixer blend the soup until smooth. You can also use a blender but be sure to blend soup in small batches as the content is hot and you can get burn. 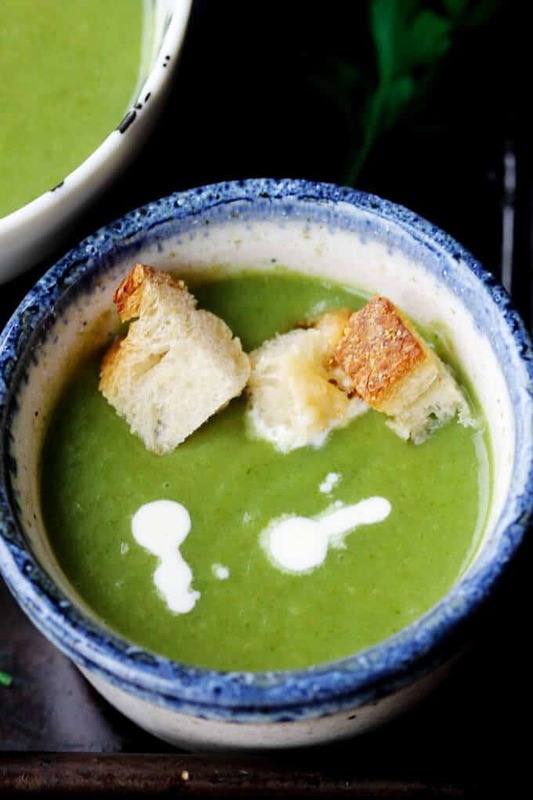 Serve the soup in bowls with Parmesan croutons and a dollop of cream. 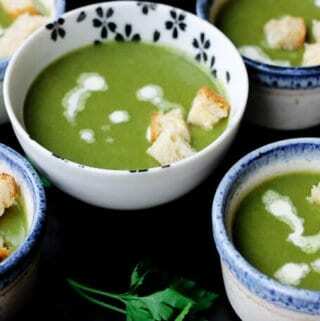 I love creamy vegetables soups like this and I think the spinach makes a beautiful color! Also I’m totally seeing a smiley face in that bowl on top! What a great way to prepare spinach! A pretty potato soup just in time for St. Patricks Day. You’re right. The color is just perfect for St. Patricks day. What a beautiful soup. Love the bright color. Perfect for St Patricks Day meal.